One of the key elements of the Chamber’s mission is to be a Champion for our Community. Delivering on that commitment takes on many different forms, including advocating for decisions that will strengthen the community in the long-run. The Chamber board of directors met that standard recently when it voted to endorse two key community investments … Measure U (City of Santa Maria) and Measure Y (Allan Hancock College). In doing so, the board focused on the critical role the issues involved in these two measures play in the overall vitality of our economy and community. Measure U will renew and expand a local sales tax measure originally established in by voters in Santa Maria in 2012. Over the past six years, Measure U has become a critical resource in the City’s ability to fund public safety and other critical services. Revenues generated by Measure U fund nearly 10% of the sworn police officers and 20% of the uniformed fire fighters. Additionally, Measure U has helped to fund improvements in the Santa Maria levee, expanded hours at the City Library, and supports other critical personnel in areas including parks and code enforcement. As currently configured, Measure U will sunset in just over 3 years, leaving a huge gap in already strained city finances. Recognizing that a foundation issue for a vital community is a safe community, the Chamber was one of the first organizations to endorse Measure U and is actively supporting the campaign to renew this important investment. 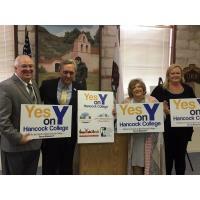 Measure Y would authorize Allan Hancock College to issue bonds that, when matched with state funds, will lead to significant upgrades in facilities on the Santa Maria campus and in key workforce training programs throughout the College’s district. In addition to upgrading to the physical education building (home to Hancock’s sports medicine program) and public safety training complex, the bond will also construct a new Fine Arts Complex on the main campus and upgrades to the Solvang Festival Theatre. Funds will also be used to modernize technology and enhance existing science, technology, engineering and mathematics (STEM) programs. The Chamber board acknowledged the key role Hancock College plays in preparing local residents for workforce-ready careers. Additionally, the Chamber recognized that the College’s programs have significant economic impact as they help draw tourists to the area and improve the overall cultural attractiveness of the community to new businesses and key employees.